Paulo Mourao, 67, performs as Santa Claus at Copacabana beach in Rio de Janeiro, Brazil, Thursday, Dec. 21, 2017. 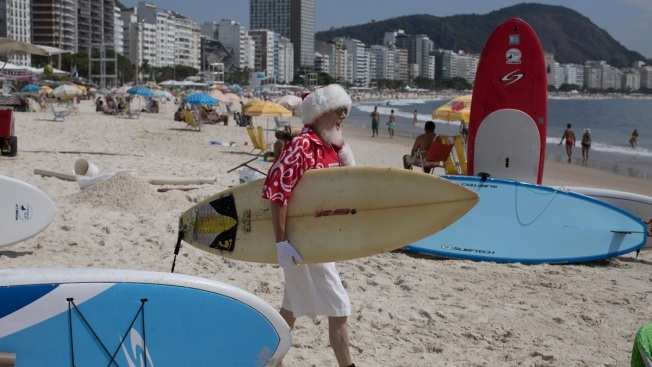 Mourao went to the beach as a Santa Claus surfer to celebrate the beginning of the Summer in the southern hemisphere. Santa Claus has shed his suit and grabbed his surfboard to celebrate the first day of summer in Brazil at the famed Copacabana beach. Actor Paulo Mourao, with a white beard and a Santa hat, greeted children and dipped his toes in the Atlantic Ocean in Rio de Janeiro on Thursday. He said it was too hot for the full suit and instead wore shorts, a t-shirt and a Hawaiian shirt. While Christmas is associated with crackling fires and snow-laden trees in some parts of the world, in the Southern hemisphere, it's a time for a trip to the beach and a barbecue. With many schools already closed for the holiday, Copacabana was packed with kids. Many, like 8-year-old Sofia Camerao, ran up to chat and high-five with Father Christmas.